Hundreds of people from Sydney, Melbourne, Wagga Wagga, Albury and other NSW country areas gathered in Canberra to pray for the integrity of government and for Australia, particularly for marriage and family life. The 5km National Eucharistic procession was promoted by The Rosary Crusade, Servants of Mary Help of Christians, and the National Association of Catholic Families. Concern over possible future moves by politicians to redefine marriage was foremost in the minds of pilgrims. After Mass at St Christopher’s Cathedral, Archbishop Christopher Prowse blessed the pilgrims as they set off. 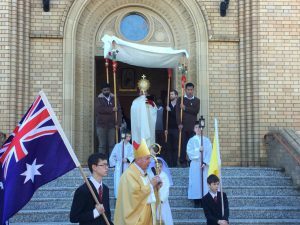 Carrying the Blessed Sacrament under a canopy, Fr Reece Beltrame and servers led the procession, followed by religious Sisters and the lay congregation. A large statue of Our Lady Help of Christians was carried toward the rear of the procession. Pilgrims sang hymns and recited the Rosary and litanies as they processed through beautiful parkland. Archbishop Prowse hosted pilgrims at Archbishop’s House where he celebrated Benediction at the completion of the walk. The Curtis family from the Archdiocese provided a sausage sizzle and drinks for those who had no lunch. Fr Beltrame gave a short talk to pilgrims about the oppression and persecution of Christianity, and the need to stay close to God, to pray much and to strengthen their faith with Eucharistic adoration. The final action was to pray the Divine Mercy Chaplet.